GOV, while maintaining access to the timeline and viewer. CTL-drag the preset to the timeline, and your in/out markers will affect the duration and placement of the preset. Viewer". Then on the new viewer push the "spike" so that the viewer stays with you when you go into graphics again. clip, instead of displaying RGB channels. Displays all strokes in time. Changes layer order of strokes. Layers can be locked or hidden by r-clicking on layer in GOV. keyframes automatically stretch with the duration. stroke, changing parameters changes the tool. Sort of like Illustrator. Freehand Tool: Settings for tool, shape, color and strokes. • Path: Closed, Constant interpolation, or Fast feedback. • Curve fitting: Lower Tolerance for more points, Higher Tolerance for more cleanup. To close a shape: Select, edit shape, then choose close shape. Sampling Ratio: Edits brush exactness to its wire frame. Opacity settings for both the Brush and the Brush Effect. contain the brush; brush effects and fill effects. Tip: Holding down 3,4,5 will allow a re-mapping of the colors. NOTE: Re-order the screen buttons to match keyboard layout for consistency. You can set the Font on a per character basis. Use font hinting for static text only. Don’t use Font Hinting—looks bad. The Filtering checkbox applies only filtering, and the Sub-Pixel Positioning will permit sub-pixel positioning. To get sharper edges on text, turn Filtering OFF and turn Sub-Pixel Positioning ON. much better now but still has some room for improvement. The reason you get soft lines is because of subpixel positioning; When the text is rasterized into pixels, horizontal and vertical features of the letters may or may not align precisely to the pixel grid depending on the size, kerning, and letting of the text block... the baseline of a letter might not wind up exactly on scanline 400, it might be on 400.3 -- which of course doesn't actually exist, so the bottom of the letter gets partially antialiased onto the line below which makes things look fuzzy. The smaller the text, the worse it stands out and looks blurry. If you turn subpixel positioning off, things should look sharp. However if you then start animating that text in Graphics, it will move around rather chunky as the text block 'snaps' to whole pixels. So, you just have to pick and choose depending on the situation. First, I never use Filtering - this is all we had before subpixel positioning but now it just does more damage than good. For small disclaimer-type text or anything that doesn't move, I turn off subpixel positioning; Everything else gets subpixel on. I generally leave the Supersampling at 8x8. In the case where you need subpixel positioning for doing fine kerning or some other reason, but certain lines look fuzzy, about the only thing you can do is select the line in question and change the Character Transform in Y by small amounts (like +/- .1 increments) until it sharpens up sufficiently. Might have to do it in X too but that's usually less noticeable unless the font is very thin. If you use very small letters in a roll and you are getting a wobbly feel. If the roll is white letters on black you can try to do a "manual antializing". Add a dark grey edge to the face. You will not see the edge if it's dark enough and the wobbly bits become much better. For rollers I have Subpixel Positioning on, Use Antialiasing checked, and Supersampling either at 4x4 or 8x8 depending on what looks best. Go to Windows START>Programs>Accessories>System Tools>Character Map. Choose the character you need from the display window, hit SELECT, hit COPY, then paste it into your DS title. I’m using the standard MS MINCHO font that can be installed from the operating system CD. 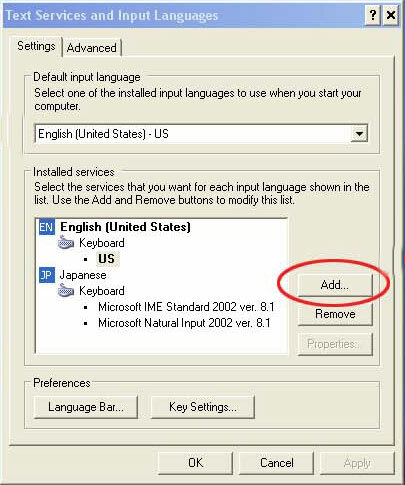 For the Japanese Keyboard Layout it’s the Microsoft IME Standard that can also be installed from the OS CD. I’m using an English keyboard too. You basically use the English alphabet (English Keyboard) to type out the Japanese sounds. It’s called ROMAJI. If someone needs more assistance, I’d be glad to help. By the way there are only 5 vows in the Japanese language. For the rest, you just add a consonant to each of the vows. I’ve never used the Character Map method. First of all, the language settings must be set in Windows. 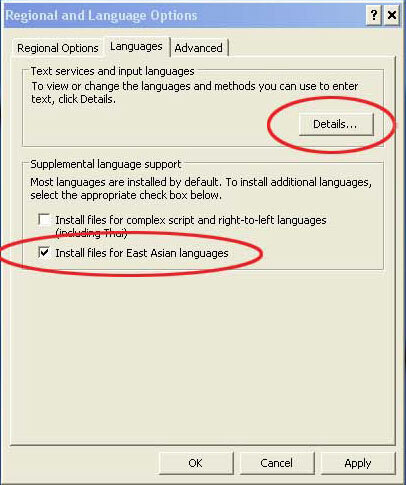 Go to the “Languages” tab and select the “Install files for East Asian languages” check box. Once it’s finished copying the files, Restart the machine. Go to Control Panel / Regional and Language Options / Languages tab. Click “Details”. 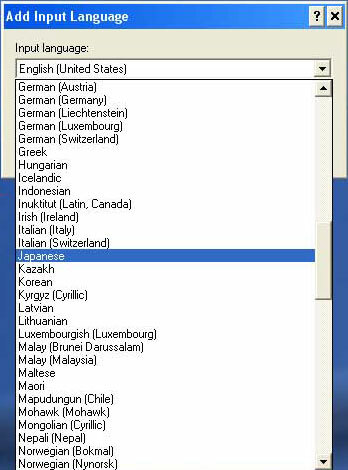 In the “Settings” tab, click “Add” and Select “Japanese” from the Input language list. Click “OK”. Confirm that the Japanese Keyboard IME is listed in the ”Installed Services” list. On the bottom right corner of your TASK bar, you should now be able to select between Japanese and English. Now inside DS, go to the Graphics panel as you would normally do when you type English Text. Select the Text tool, and click in the Source/Record monitor viewing area. 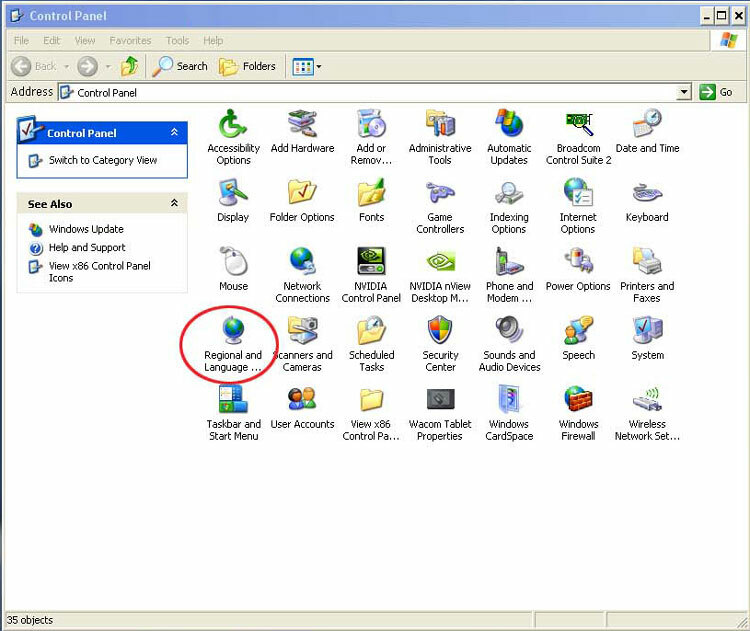 Select the Japanese IME at the bottom right corner of the TASK bar. Also make sure to select “Hiragana”. 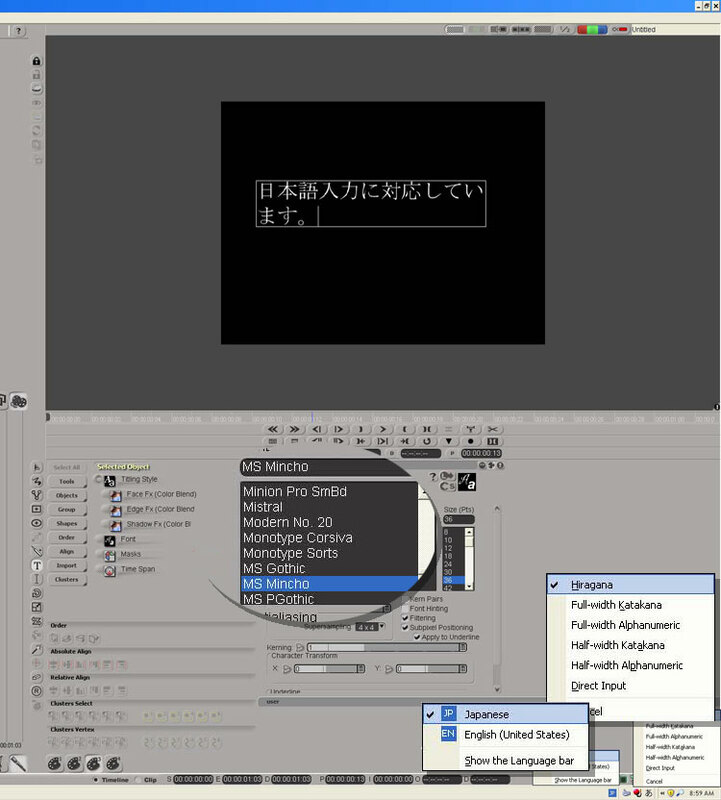 *By installing the Japanese Language option in the previous step, you should find 2 or 3 default fonts. If you installed 3rd party fonts, you will need to select those instead. The characters appear in the top left corner of your source/record monitor, and once you press “ENTER”, the confirmed text will appear in the TEXT area that you designated. Sometimes, the language bar might be detached from the TASK bar and get behind the DS window. If that happens, click on “Show the Language bar”, which is located right underneath the Japanese and English IME menu. Please note: Avid DS's Graphics Tool does not support writing in a language that goes from right-to-left, such as Hebrew or Arabic. Additionally, the sub-titler, which is built on the paint/titler module does not render right to left fonts correctly. Select the text box and hit the "text to strokes” button. It creates a layer for each of the letters and makes it much easier to animate individual characters. Add a Graphics effect on the clip. Draw a brush stroke color blend over the text body. Trace each character with the brush stroke. Make sure the stroke fully covers the characters. That brush stroke will be used as a mask later in your graphics session. Select the text body and set the following Masks properties: "Use alpha channel" and "Invert". Cut the brush stroke(s) in the clipboard. Now, apply another Graphics effect on the clip and push it below the first Graphics effect. The brush stroke(s) has a handwriting animation. It will "reveal" the text characters over time. Create a single brushstroke that covers the words from start to finish as if you were handwriting it. This can be rough-ish at this stage. Edit the shape so that it covers all the text neatly, not forgetting to cross the Ts and dot the Is. Animate the stroke with "Handwriting". Repeat 6 & 7 "for a couple of hours"
Make sure your not painting on the RGB and that your Painting on the Alpha channel only. Check the correct check boxes in the Masking tab. Once your "effect" is painted/built/animated. Place the output of the Graphics node into a composite node above your background image. Paint a Black & White "Wipe Effect" animation within the Graphics node. In a tree add a "Key Combiner - Luma" effect. Plug the Black & White animation into the "ALPHA". Plug the .png image into the "RGB" portion of the Key Combiner. Way 2 will give you the most flexibility. You will be able to edit, effect, alter your "Matte" with various effects that Trees have to offer and that the Graphics node does not. At the intended beginning of the roll, place the text body in its start position (usually barely bottom-off-screen). 7. Set a second keyframe. 10. In the Animation Editor's Curves menu , choose Relative Cycle. In the Negative node, on the Masking tab turn off R/G/B processing and turn on Alpha. In the Composite node, set L2's Alpha to 'Atop'. Adjust Drop Shadow to taste. to have to work face, edge and shadow individually. effect. OR razor a clip if you need to fade inside the same clip. effect on top and use one sided transitions (alpha fade in and out) to fade the graphics. Cloning is raster paint based on vectors. 1 will toggle to erase a stroke. An erase stroke is recorded as a stroke and can be reordered as a layer in the GFE. SOURCE POINT—spatially, where to select pixels from in the frame. Set the Source point: In-place, Relative of Constant. Pick cloning source point with the “6” key. RELATIVE pick an offset for previous or later frames to select pixels from. Burning frames in cloning upon frame change as an option instead of rendering the container in the parent timeline. This is NOT Undo able. It will prompt with a warning before burning; this warning can be disabled. Both deinterlacing and reinterlacing and 3/2 contact and 3/2 expand require rendering. want/need the cache yet. Render on frames if you do. Apply a graphics effect and do your work. Render on frames. reinterlace to put it back together. To get a round corner on a rectangle as you draw it, draw the rectangle and hold down the [ or ] keys. Round to suit! Select the Rectangle tool and set a Corner Radius in the main tool's PPG. If you have all ready drawn the rectangle, you cannot round the corners after the fact. set a keyframe on the "edit shape" property page or you will get a slow float. Q: When working in the graphics tool polyline function, how do you "break" the curve handles so that you can operate them independently from one another? A: Hold down 'B' for Break and manipulate one or other of the handles. U will 'Uniform' them again. if you select a clip and press T you will get Time. H adds the handles if they were not exposed. If you are having trouble with artifacts remaining on screen while moving graphic objects around, try purging memory caches.